So here we are on You Only Live Twice, otherwise known as “that one where James Bond makes himself look Asian“. This film, like previous entries, is a product of its time. The space race was in full swing and SPECTRE is using this against the two superpowers of the U.S.S.R and the USA to start a war. The plot for this film is just downright preposterous, but the scenes in space look cool in a dated sort of way. The screenplay was written by Roald Dahl and despite being a little absurd, it still has all the classic Bond witticisms, exotic locations and beautiful women. 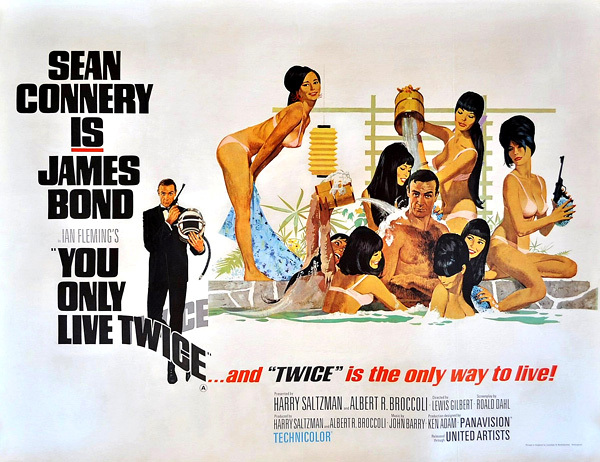 Just when we thought the Bond girls were getting better, You Only Live Twice is perhaps the most sexist entry so far. One scene see’s Bond and Tiger (Japan’s version of M) being washed by a harem of half-naked Japanese women. 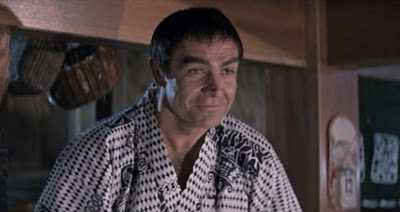 Tiger remarks that “In Japan, men come first, women come second.” To which Bond replies “I might just have to retire here.” It’s a bit awkward to watch Bond be so offensive, but it’s a product of its time. I don’t think anyone could watch this and ACTUALLY be offended, it’s interesting to watch films like this and see what attitudes were like back then. The ending to You Only Live Twice is so amazing, even now. It is in this film that we finally find out who’s in charge of SPECTRE. It’s, the since often parodied, cat-stroking Ernst Stavro Blofeld. Donald Pleasence is brilliant as the criminal genius and seems so evil. It’s just a shame that this is his only appearance as Blofeld, as he is the one and only Blofeld in most people’s eyes. The ending sequence itself takes place in Blofeld’s secret volcano base. That’s right, a secret volcano base! Bond infiltrates the base and is backed up by Tiger and his army of ninja’s. Again, you’re not seeing things. NINJA’S! This last assualt on the base is astounding and is a brilliant action set-piece for 60’s Bond. It’s even more remarkable when you realise that this whole set was built by hand, no fancy CGI here. It’s a shame things aren’t like that now. This film also has another Bond staple, recurring actors. Here it’s Charles Gray in a short-lived but memorable role as Bond’s contact; Henderson. Gray shows up again as Blofeld himself in Diamonds are Forever. It’s a bit strange but Gray is awesome so he’s a welcome return. Also this is the Bond series, in which the main character is played by a different actor every few films. I think we can let i go. Overall this is a weird entry. It’s sometimes racist and often sexist but it’s so much fun. Japan looks beautiful and the final 30 minutes is just brilliant. Sean Connery’s Bond remains brilliant throughout although I couldn’t help thinking perhaps a change is in order. Just not George Lazenby.